Plastics products are infiltrating into almost every area of our daily lives, It seems that everything we touch has some plastic component in its construction. 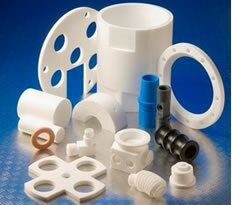 In mass produced consumer products, these components are generally injection moulded, due to the large volumes produced. There are however, many items manufactured for specialist applications or special processing machinery that are not able to be injection moulded either because they are too complex or the tooling would be just too prohibitive to manufacture for small quantities. It may transpire that a product can go through an entire range of processes from a one off prototype, to small production runs through to mass production by injection moulding. At any stage Macplas LTD can help with the design process and offer advice on which manufacturing process is best suited to your individual part. Plastics are used in many common applications as an alternative engineering material to traditional products such as Steel, Stainless Steel, Aluminium and Bronze. Engineering Plastics can be machined on most common cutting machines found in General engineering or precision workshops. Many wood working machines also successfully cut plastics, Routers, Spindle moulders etc. Examples of applications include ball valve seats, chain wear guides, cutting boards, wear pads, nozzles, gears, sight glasses, pivot bushes, thrush washers, etc. Whatever your application, Macplas LTD can help with the correct solution to ensure the right product, material and design of your product.